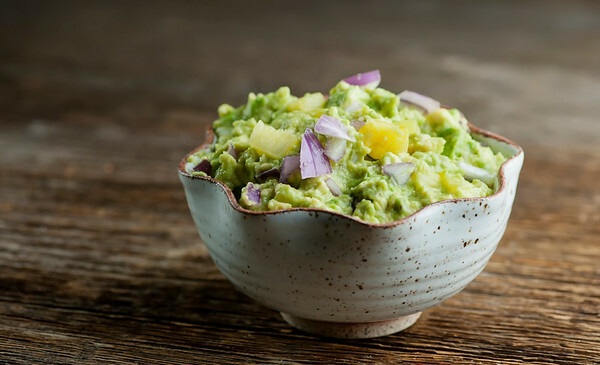 Take everyone’s favorite avocado appetizer to even more delicious heights with this recipe for easy pineapple guacamole! Who knew guacamole could get even better? If you dropped me on a desert island and told me I could have one and only one nibble type of thing for the rest of my life, I would pick BACON. But right after bacon, I would pick creamy, dreamy guacamole with its combo of silky avocado and tart lime juice and salt (which as far as I am concerned are the only things you need to make classic guac, thank you very much). But since I have staked my reputation of taking perfectly innocent classic recipes and messing with them, I decided to up the excitement in my kitchen, guacamole-wise, by adding in some pineapple and a little chopped red onion and you know what? You CAN teach old classic guacamole new tricks. Let’s make it! The only other thing I added to this magical mixture was a pinch of cumin, mainly because I wanted there to be a fair fight between the bite of the onion and the sweetness of the pineapple. A little spicy cumin was just the ticket, and in no time I had a bowlful of sweet and spicy avocado deliciousness that the Southern husband and I polished off in no time. However, that left us with the question of what to do with the rest of the pineapple. You can make this with canned pineapple, but it is SO easy to chop up your own pineapple, and there is something so satisfying about putting a pineapple in your shopping cart? Try it. However, since this recipe only calls for about a half a cup of chopped pineapple, that leaves you with a whole lot of wonderful sweet pineapple. Now, you COULD make pineapple shrimp gazpacho, or pork and pineapple tacos…but frankly I was so head over heels with this new guacamole that I just went ahead and made it again. And spooned it over sliced grilled chicken. Which may have ruined all other chicken recipes for me, at least until I get this recipe for easy pineapple guacamole out of my system. I’ve already warned the Southern husband that we may need to buy avocados and pineapples at Costco for the time being. For, you know, VOLUME. So go ahead – pineapple up your guacamole! Stir in lime juice, salt and cumin. Stir in onion and pineapple. 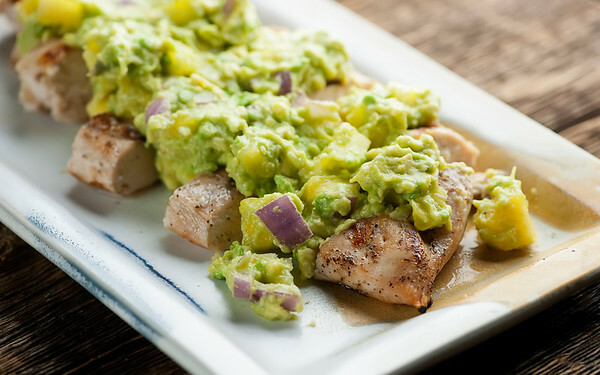 This guacamole is great both as an appetizer or spooned over grilled slice chicken or steak! Pineapple in guacamole sounds so yummy! Must try! I am not one to usually mess with a good thing, but I’m willing to give it a try with this pineapple guac! I think it sounds fantastic! The desert island food game, huh? Something I didn’t love, probably, because I’d grow to hate whatever I picked. If I was rescued, I would still love chocolate! This is creamy and dreamy. Pineapple is SUCH a good idea. As old as I am Kate, I tried guacamole for the first time a little over a year ago! I don’t know what I was thinking! I’m usually game to try anything but I just never wanted to give it a go! But since my nephew talked me into it, now I’m hooked! I LOVE it! I’ve never thought of adding pineapple to it though, so I’m definitely going to try it. Sounds delicious! This looks delicious, Kate! Sometimes I tend to mess with recipes, too. I just get so darn excited, lol!! Love twist with the pineapple. I love avocado and I love pineapple so combining them is awesome! Just when I thought guac couldn’t possibly get any better, I see this PINEAPPLE guacamole. Love, love, LOVE! I love messing around with guac – there are endless possibilities to its wonderfulness! I’m picturing a grilled ring of pineapple topped with a scoop of your quac and topped with lots of crumble bacon, oh where the mind does wander. Oh my gosh, now I am picturing the exact same THING!! Guacamole is one of those things I can never say no to. Love the addition of pineapple in this one. It sounds delightful. Guacamole is pretty much the perfect appetizer, spread, etc. in my mind. I could just eat it by the spoonful! This pineapple version sounds fantastic, Kate! Love how easy this is to make, too! Another thing you and I have in common – guacamole love! I can eat guac every day and not get bored!! This version sounds delightful! Me TOO! With so many things! Guac should be an official food group, I think. And the pineapple also looks so festive on the counter…like there is a party in the near future! Volume definitely needed when it comes to guacamole! Always such a hit at parties and I love this twist with the pineapple and red onion – perfect for Cinco de Mayo! Would brighten up anything on the menu and cool down spicy dishes – totally perfect! I’m definitely rolling this one back out for Cinco de Mayo! All of my favs in one bowl. Pinned! Also – I love fresh pineapple with Mexican food. This is a must make! Pineapple and avocado sounds like a great pairing, Kate. I just love this yummy version of classic guacamole. Can’t wait to give it a go! this is a very fine way to add color and sweetness to one of the best dips of all time! Kate, I love the addition of the pineapple to this guacamole. My kids love pineapple – I love bacon and I think the marriage of the two in this guac is perfect! Thanks for sharing such a fun recipe.